Of our 3 weeks on Crete, this was one of our favorite locations. Our room had a beautiful ocean view. The yard is very nice, and the apartment is in close proximity to some of the best beaches on Crete. Highly recommend! The hosts went above and beyond to ensure a comfortable stay. Clean and comfortable,next to the beach Ammoudara. Free parking, sunbeds and umbrellas for the guests, free pool access.Pool is clean and nice temp.Only 5km to the center of Heraklion. Updated room,great location and breakfast was awesome!!!! The staff was super friendly and helpful. The breakfast at the beach bar is a huge bang for your buck. The property is on the beach, but still in the city. Attractions were very easily accessible by bus. The beach and pool were great. The poolside bar has a great selection. Very scenic on the beach. We loved this hotel! Small and family ran, the owners were friendly and knew us by name. The food at the bar was excellent and inexpensive, and every employee at this establishment was friendly and hard working. We loved the pool and beach. Never overly crowded and we always were able to find a sun lounger. The facilities are clean, the rooms are air-conditioned, and the wifi signal was good. Easy proximity to a bus line from the airport. We would definitely stay there again. Sophia was friendly and full of useful information and assisted us with our tour bookings. John and the bar staff were friendly and available for a chat. Breakfasts were good value for money. You wont be hungry after breakfast. The rooms were serviced daily and the cleaning staff very helpful. Bedding clean and in good condition. Good pillows. Comfortable mattress. Spacious room and good balcony. Good size bathroom, decent shower. We LOVED having a pool and the beachfront property. The waitresses that served everyone on the beach were wonderful. The beach chairs were great. The water and sand at the resort were clean and lovely. The staff were friendly and lovely. Recommended a seafront fish restaurant that we drove to and loved. The location was great. Tons of great cafes and restaurants within a few minutes walk. Good rinsing station and lovely loungers and cabanas on the beach. The cafe food was excellent. Wish we'd had more nights here! Lock in a great price for Frank Apartments – rated 8.8 by recent guests! Offering a pool with sun terrace and a restaurant, the beachfront Frank Apartments are located in the heart of Amoudara Herakliou. They feature self-catering accommodations with free WiFi access and a furnished balcony or patio. Facilities include a snack bar. All air-conditioned studios of Frank have a TV. Each is equipped with a kitchenette with a mini fridge and cooking hobs. Some units come with direct or partial Cretan Sea views. Guests may enjoy light meals and refreshing beverages at the property’s snack bar. Free sun loungers and umbrellas are offered both on the beach and at the sun terrace by the pool, where guests may relax. A garden with plants and trees is featured. A mini market for the general supplies can be found within a short walk, while a bus stop is just 150 feet away. Heraklion International Airport is located 5.6 mi from the property. Free private parking is possible on site. When would you like to stay at Frank Apartments? 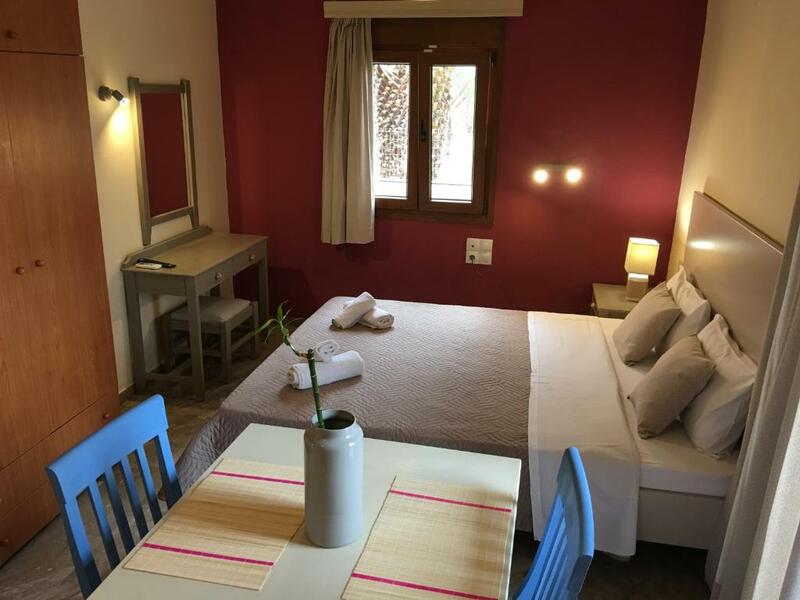 Offering Cretan Sea views, this air-conditioned studio opens to a furnished balcony. It features a TV and a kitchenette with a mini fridge and cooking hobs. Free WiFi is provided. This room can accommodate a child up to 12 years old. A sofa bed is provided. This studio features a kitchenware, private entrance and stovetop. The balcony offers side sea and mountain views. This studio features a kitchenware, air conditioning and tile/marble floor. Located on the ground floor, this studio has a balcony with partial sea view and air conditioning. Frank Apartments is located in the center of Amoudara, among countless shops, markets, a medical center and pharmacies. In our private entrance, nearly 50 metres from the beachfront, you will find that our facilities offer everything you need, all in one place. Our renowned beach bar offers delicious meals, and unique coffees and cocktails from morning to night where one can relax and enjoy the breathtaking view of the mountains, sea and surrounding cities. We have been running our family business for nearly 25 years and as Frank's daughter, I have learned the tourism industry by following in my father's footsteps. It has become my passion and my career and I plan to continue his legacy. Amoudara is a perfect location for visitors because it is just 5 kilometres from the ancient city of Heraklion. Visitors can explore our town's famous Venetian fortress, Knossos Palace, and our incredible museums. Every step you take, you will discover a piece of our history. Beautiful cafes, traditional Cretan taverns and shops of all sorts fill the city with life, so there is always something exciting to do. House Rules Frank Apartments takes special requests – add in the next step! One child under 12 years is charged EUR 6 per night when using existing beds. Frank Apartments accepts these cards and reserves the right to temporarily hold an amount prior to arrival. Kindly note that cleaning service and change of towels takes place every 2 days. Please note that the pool bar and the restaurant are open from May 1st until October 15th. Free sun loungers and umbrellas are available on the beach until the closing of the season. Kindly note that the staff at Frank Apartments speaks Georgian. Kindly note that as of the 15th of October, breakfast will not be available. Please note that check-in is possible until 24:00. Guests arriving after midnight should let the property know in advance. Please inform Frank Apartments of your expected arrival time in advance. You can use the Special Requests box when booking, or contact the property directly using the contact details in your confirmation. It’s really noisy, you can hear everything from the neighbor or the air conditioning of the neighbor, the electricity mechanism, you didn’t sleep very well. But they were very nice and sympathie. Frank and her wife are so nice and kind, they will do all they could to help you for anything. Very nice people. Furnitures were old but efficient. Very good place if you don’t want to stay in heraklion. Beach is very nice and swimming pool are ok. I won’t recommend it for romantic vacation. Small detail really but no chopping board or decent kitchen knife in apartment. Had not intended to cook but just fruit cutting etc. Great location for local restaurants and right on the beach. The bathroom needs some attention, leeking toilet water and the shower head came off every time. The Staff is very friendly! We came in late, so they emailed us the room number and location and the roos was open for us. The rooms are fine.. Swimming pool en Bar where clean, breakfeast was great!! Location was great, you can just walk into the sea. We had a very good stay!! Personal hosts at the bar/ good breakfast at a top spot! Lookng out over the sea which was about 10 meters away. You Could choose where to sit for your breakfast. No mass tourism. Frank Apartments are the best in Amoudara.Frank, Sofia and family are the perfect hosts. As soon as you close the window you have immediately a terrible odor coming from the toilette in the whole apt (that's why at the arrival the windows are all open). The toilet is very outdated, the furniture in the bathroom is old and in bad condition. Missing essential services like the hairdryer. "Nothing is a problem, everything is possible" is the general feeling one gets at Frank Apartments - from the email communication (always quick, helpful and accommodating) to the assistance you get on arrival and during one's stay. Everybody is helpful and enjoys a small talk and providing any information one needs... Rooms are spacious and have everything one requires, if not - just ask! Beach is private and big enough, plenty of nice tavernas around and bus stop to Iraklion is 5 m away... Thank you, Sophia, Nina, Frank and the rest of the crew for your hospitality! didn't like having to leave !!!! Close to beach and shops. We used the hop on-hop off bus to get into and back from Heraklion. Our pass lasted 2 days so was good value. The staff at Frank's are very helpful and friendly. It's not 5 star but doesn't claim to be - great value! The pool and the beach is just accessible to us. The staff is accommodating too. Loud french animation from nearby hotel in the evenings. No microwave owen. 1) Direct access by bus from airport and harbor, direct bus to knossos. (download the app of the local bus company to track buses online). 2) Friendly and helpful owner and staff. Everyday room cleaning. 3) Good swimming pool and beach. Sea is not very deep near the hotel, you can get about 50 metres away, with a bottom down your feet. Perfect place to teach swimming. Free beach beds and umbrellas. Nice beach bar. 4) Rooms are normal, kitchen (in the room) is rather nominal, however its possible to cook there. 5) Free WiFi in the rooms and at the beach.